Last summer at General Convention, Presiding Bishop Michael Curry introduced “The Way of Love.” The Way of Love is not just a program or curriculum but rather a way of life, a commitment to follow Jesus, by consciously engaging in seven spiritual practices: Turn, Learn, Pray, Worship, Bless, Rest, and Go. Together they help us not only go deeper in our faith but actively engage the world as servants and co-missionaries with the Risen Christ. 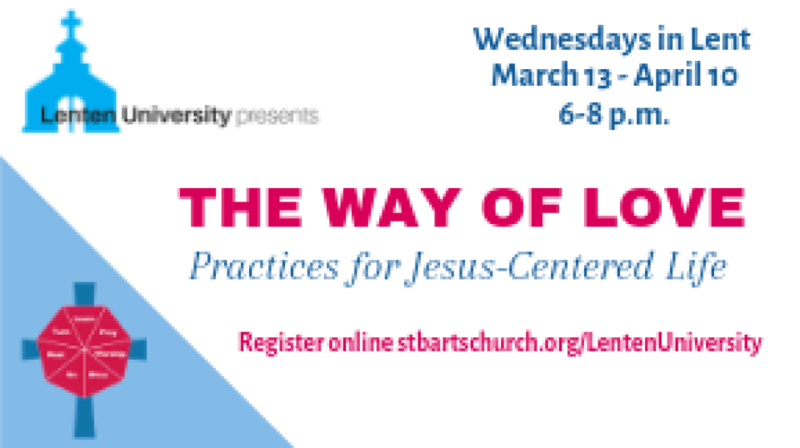 Each session will begin with a simple supper, followed by prayer, the evening program, and then ending in worship. Each will be a time for reflection, learning, fellowship, and engaging our curiosity as we seek to discern where God is calling us as individuals and a community. Register online or contact Beth Dean.